Besides calling and texting, email processing is yet another key transaction many people do with their respective mobile devices. With smartphones, you can check emails at anytime and anywhere you want for as long as network connectivity is available. Needless to say, smartphones are becoming one of the most essential devices anyone should secure so as to carry out daily routine tasks with ease and quickness. But then again, not everyone has good mobile mailing experience at all times. Considering the fact that network connectivity is a key requisite in email processing, mobile emails can likewise get interrupted when network issues occur. This problem can affect any mobile device whether it is running on Android or iOS platform. And this post is dedicated to the latter devices, particularly Apple’s iPhone 6s Plus. Hence if you’ve come across this page while searching for potential solutions to an email issue on the same device, then this content might be able to help. Feel free to try any of the suggested solutions and workarounds to deal with email issues such as problems with sending or receiving emails, and other Mail app errors you may have encountered on your iPhone 6s Plus device. Aside from network connectivity issues, there are also other factors that can trigger some errors to occur while using the iOS Mail app for sending or receiving mobile emails. And they are outlined below. Random glitches – software inconsistencies can happen anytime and randomly. There have been several cases where iPhone users are unable to send or receive emails due to certain isolated issues with the mail application. Sometimes, problems do occur after making some changes to the Mail app structure like installing updates for the app or downloading some stuff that might have triggered the Mail app to experience minor glitches. Improper set up – in order to send and receive emails on your mobile device, you are first required to set up your email account. During the setup process, you will be prompted to enter or configure settings including server settings to your mobile phone’s email system. Any incorrect entry during the email setup process can result to a later problem in sending or receiving emails. This is most likely the case if you are prompted with errors when attempting to send or receive emails on your iPhone 6s Plus right after the email setup. Account-related problems – outgoing services in mobile devices like sending of emails can also be halted by account-related issues. Some carriers would impose temporary deactivation or restriction to outgoing services including email services for accounts with issues to settle. Thus, this factor must also be considered before doing any troubleshooting. Hardware problems – although this may sound bizarre, hardware problems can also be a possible reason as to why you are unable to send or receive emails on your iPhone. It’s likely true if the onset of the problem happens after incidents of dropping or liquid exposure on your iPhone. Symptoms of hardware damage can occur at a later time though. Getting the right fix may vary depending on how you determine the underlying cause beforehand. You are more likely to fix the problem quickly if you already have an idea as to what is triggering it as you can immediately start working on the cause. But if you are not certain of which exactly is giving your trouble sending or receiving emails on your iPhone, then you have no choice but to run into a trial-and-error option. Below are some of the highly recommended workarounds and potential solutions to email problems in iOS devices including iPhone 6s Plus. You may opt to try any of the methods, which you think applicable to your situation or if necessary, try all of them. Just don’t forget to perform a test mail after completing each troubleshooting method so as to determine whether the problem has already been fixed or not. While these methods have been found effective on others, there is no guarantee that you’ll get the same positive result given the cause variations. But then again, it wouldn’t hurt to try. Method 1: Verify network connectivity on your iPhone. One of the most common possible reasons as to why you might be having troubles sending or receiving emails on your mobile device in network connectivity issues. That being said, be sure to check and ensure that your iPhone is not experiencing any network trouble. If you are using Wi-Fi, be sure to check that Wi-Fi service is active and stable. Do the same with Cellular Data network connection. To verify and ensure Wi-Fi network is good on your iPhone 6s Plus, go to Settings-> Wi-Fi. Try to toggle the Wi-Fi switch from on to off and then turn it back on. Doing so will sometimes fix any minor glitches to your wireless network. Alternatively, you can head over to the Control Center and then toggle the Wi-Fi icon off or on. You can access to the Control Center by swiping up from the bottom of your home screen. If you are on Cellular Network or Cellular Data, go to Settings-> Cellular Data, and make sure the feature is enabled. If necessary, toggle the switch to enable or turn the feature on. Doing so will re-establish a fresh connection between the modem/router and your iPhone and the network server as well. Once you’ve verified that your network connection is all good, try to open Safari browser on your iPhone and then see if you can open or connect to a website. If you cannot, then you will need to deal with network connectivity issue first so as to fix email problems on your iPhone afterwards. Email services are likely to resume once the network problem is resolved. 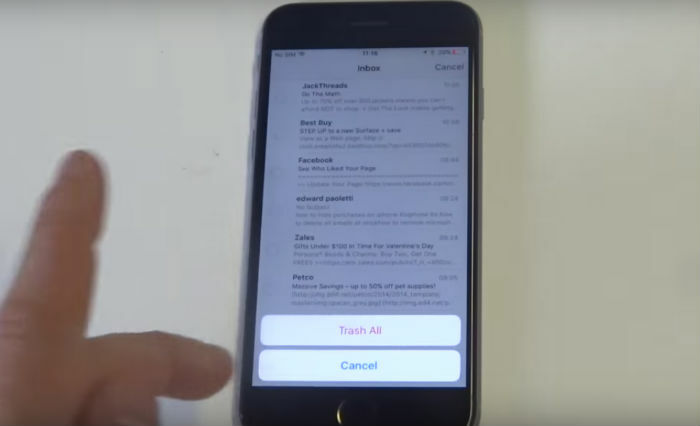 Method 2: Restart Mail app. Just like other apps, the stock Mail app can also encounter random software malfunctions. These are typical issues and often of minor types. If the problem suddenly occurs without making any changes to the Mail app settings, then it’s likely among other symptoms of random software glitches. Quitting the app and then restarting it can often rectify the glitch so you might as well consider doing so. After doing so, try to create a test mail to see if you can now send and receive emails without bumping into an error. Method 3: Reboot or soft reset your iPhone 6s Plus. Minor software glitches are often remedied with a reboot, otherwise known as soft reset on your device. It simple denotes turning off your iPhone for a few seconds and then turn it back on. The process usually fixes minor flaws that might have affected the Mail app functions so you might as well want to give it a try on your end. In the case where the Mail app or your iPhone freezes or not responding, you can do a force restart instead. To do so, press and hold the Power and Home buttons simultaneously for at least 10 seconds and then release both buttons when the Apple logo appears. After your iPhone reboots, try to open the Mail app and see if it is already working properly. Method 4: Update your iPhone 6s Plus to the latest iOS version available. Software updates are generally designed to optimized device functions by bringing in new features and fixes to certain bugs. If you haven’t upgraded your iPhone yet, then try to check for available updates and go for an iOS upgrade this time. To check if an iOS update is available for your iPhone 6s, go to Settings-> General-> About-> Software Update. You will then see a notice if an update is available. To proceed with the iOS update download and installation processes, tap the option to Download and Install then follow the rest of the onscreen instructions to complete the entire process. If necessary, reboot your iPhone once more after the update installation and then open the Mail app to see if it is already working fine. Method 5: Verify your email settings. Incorrect settings can likewise result to errors in sending or receiving emails on your iPhone. By default, iOS automatically uses the correct account settings for many email providers upon setting up email accounts on your device. If you are not sure, you can try to verify the settings used in the Mail app email configuration on your email account and see if they are correct. Also be sure to check the port number. If your email account uses port number 25, you will only be able to send email when you are connected to your email provider’s network. Method 6: Remove and re-configure your email account. If the problem persists after doing all prior troubleshooting methods, then your next best option is to remove and then re-add the problematic email account. Although it’s time-consuming, it could be the only thing you need to get your Mail app back up and running without flaws. Removing and re-adding of an email account is an effective solution for email sending and receiving problems caused by incorrect settings. It is an alternative way to rectify all messed up settings at once. If you are not certain of which information to enter for your email server settings, contact your email service provider or network administrator (for work or corporate emails). Settings for personal email may differ from corporate emails. Once you have successfully completed the email setup process, you’ll be taken to your email inbox. Messages will immediately download from your account to your phone. Or you can also sync the email account to your phone using iTunes. Sign into your email provider’s website. Check your email address and password. Contact your carrier in case you have forgotten your password. They will be able to reset the password for your email address if necessary. Other things you should verify with your network provider/carrier are network outages affecting email services temporarily as well as account restrictions. For example, a two-step verification is activated for your email account, thus requiring you to enter a special password or request authorization to send and receive emails on your iPhone 6s Plus.